Cheshire-based fashion retailer Black White Denim is facing a battle for its identity and concept which it says has been stolen by a large South African distributor. 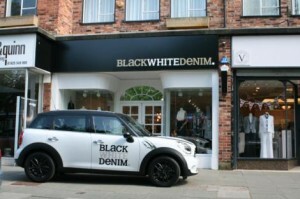 The award-winning boutique has discovered that The Scottish Knitwear Group, which runs stores for Pringle and Ben Sherman, now plans to open an outlet called Black White Denim in Johannesburg. As well as taking the same name and concept, promotional material for the new outlet includes key phrases used by the Wilmslow retailer such as ‘foundation colours’ and ‘building blocks’. Now founder and managing director Jo Davies, who said she was "shocked" and "outraged" by The Scottish Knitwear Group's alleged plagiarism, is pursuing all avenues to get the company to change its name. Explaining the retailer's concept, Davies told Prolific North: "It is very clear - our ethos is that any woman only needs to wear black, white or denim, and whatever your age, profession or occasion, you cannot fail to look fabulous. "We have worked very hard to build the brand, and I don't want customers to be confused. It is my my baby and I want to protect it." David Bell, Davies's business partner and chief executive of CheethamBellJWT, has written to The Scottish Knitwear Group requesting that they change the store’s name. However, The Scottish Knitwear Group insist they are going ahead with their plans as they were "initiated with absolutely no ill intent". "We gave them an easy option to not call their shop Black White Denim, and you would have thought it would not be too difficult to comply with that request," said Davies. She is now pursuing the matter through legal channels and garnering support from suppliers and customers. "It's the third year of the business and we hadn't planned on expensive law suits draining the cash that we want to invest in the business," she added. "We will therefore continue to use all the weapons we have available in a creative and economical way." Black White Denim has been hailed by the fashion world, quickly earning influence and a far-reaching reputation. Vogue called it a ”winning combination”, the company featured as one of the “Top 50 best boutiques outside of London” in the Sunday Telegraph and they are ranked no.4 in Drapers’ 100 Inspiring Indies.